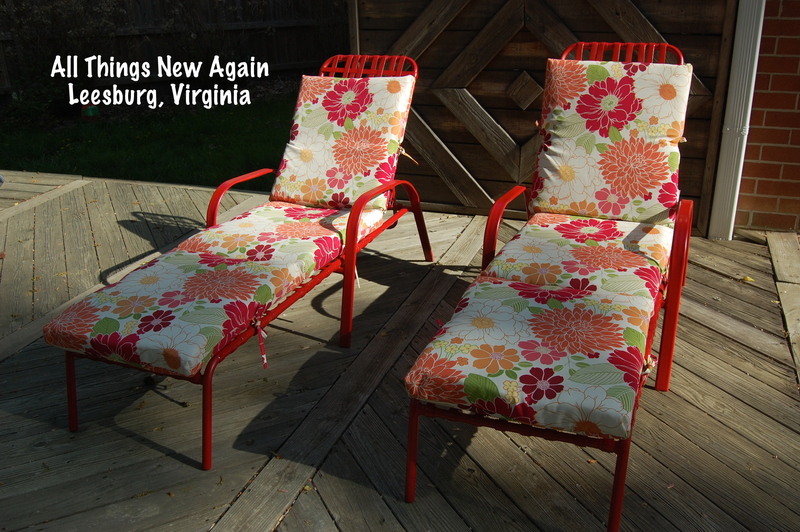 Have you priced outdoor furniture lately? It costs almost as much as a living room set! I am way too cheap to pay that much for patio furniture that is going to sit outside in the heat, endure summertime thunderstorms and get stacked up in my shed all winter. No way! These chaise lounges cost $10 each. But they looked like they came from a low-budget No Tell Motel. It’s amazing what a little Soft Scrub and spray paint can do! My mom convinced me to buy the loungers and transform them into 5 Star Backyard Seating. She bought a set too. Look how beautiful her chairs are now after my dad cleaned them up and spray painted them sage green. I chose red for mine to match the throw pillows on my patio love seat (purchased a few years ago with a Bed Bath and Beyond 20% OFF coupon!). I bought new lounge chair cushions at Walmart for $32 each. They have big red flowers on them to tie everything together. 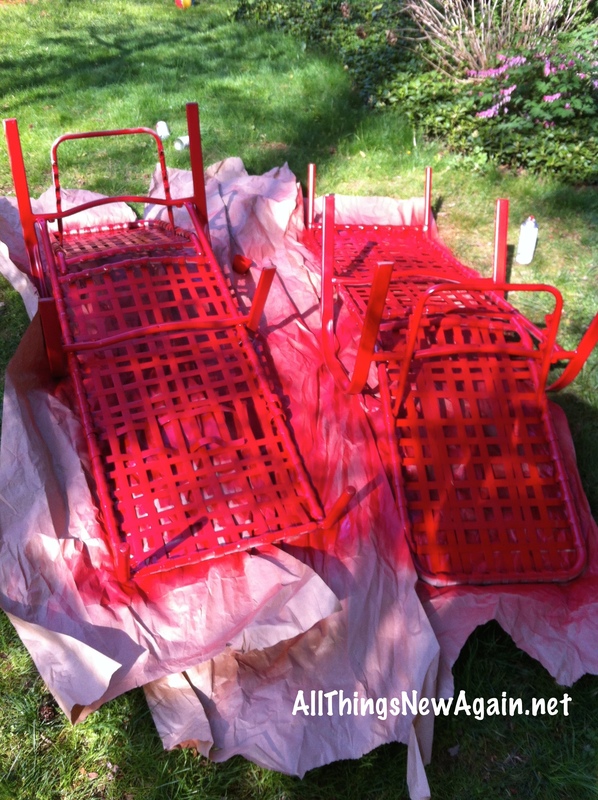 I used Krylon Fusion spray paint for this project in a high-gloss red. 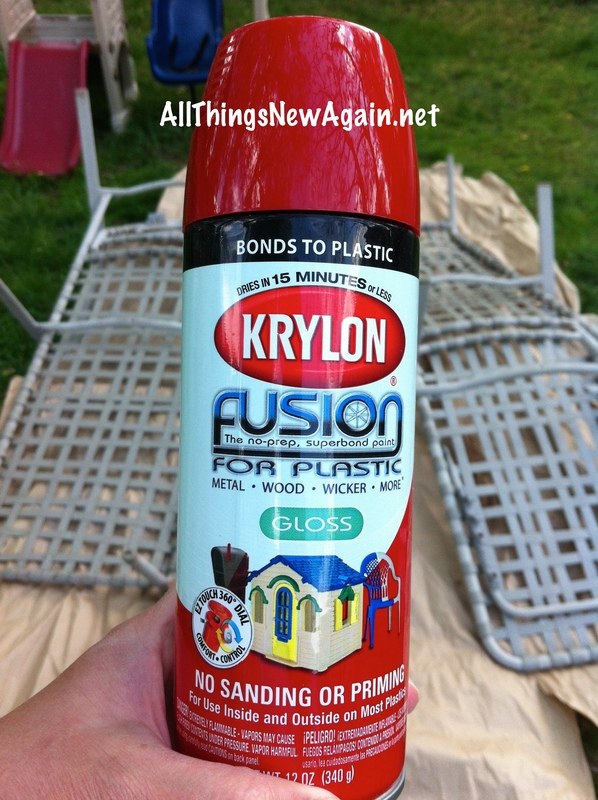 Most importantly, Krylon Fusion sticks to plastic. It dries in 15 minutes. 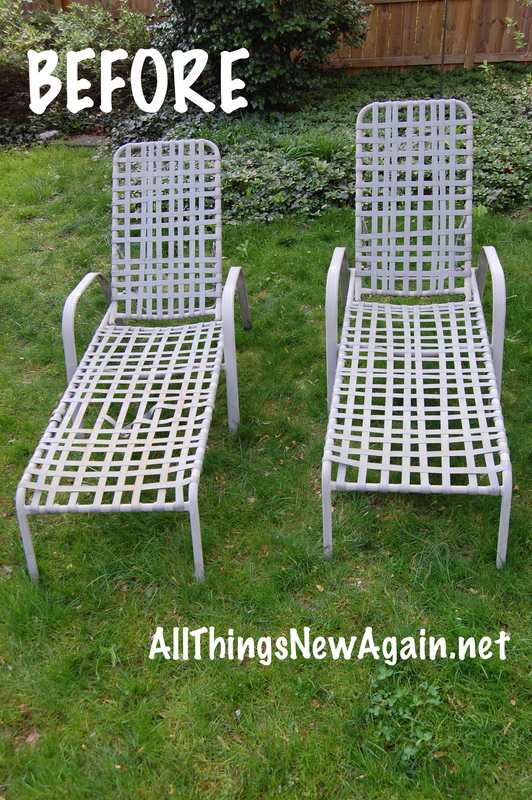 I flipped the chairs over and did the bottoms first to get underneath all of those little slats. 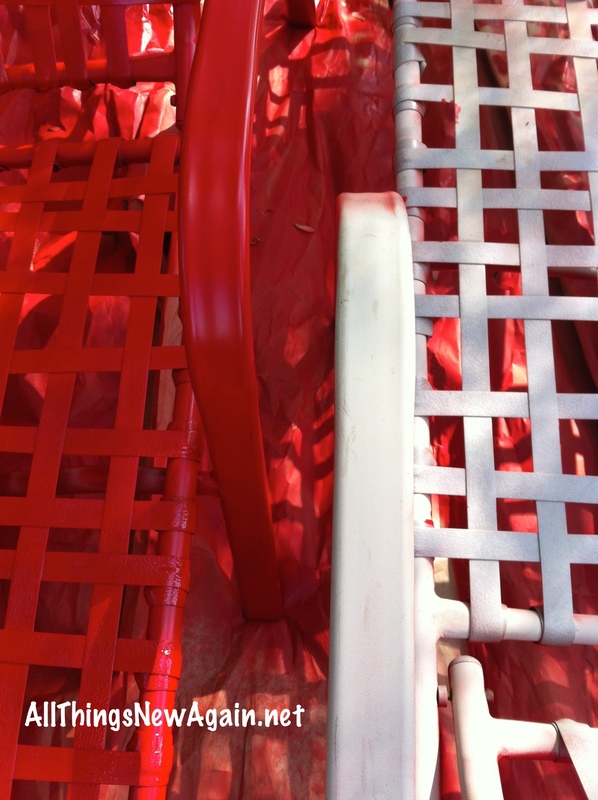 By the time I finished the second chair, the first one was dry enough to flip over and paint the top. Look at that big difference already! I bought four cans of spray paint for this project and thought that would be plenty. Very Important Spray Painting Rules. 1. Don’t spray paint on a breezy day. This one should be a no-brainer, but I did it anyway. I’m impatient and wanted to get this project done. Also, I have a short window for working while my son naps in the afternoon or else I would break Very Important Spray Painting Rule #2. 2. Don’t spray paint with a 2-year-old running around. Just don’t. You will be sorry. 3. Spray in short controlled bursts—just like it tells you to do on the can. Don’t hold your finger down on the trigger manically spraying back and forth and all over the place like you were applying Aqua Net to your Big 80’s Hair. This technique is ineffective and it wastes paint, but I get carried away and I do it anyway. Every time. My dad follows these Very Important Spray Painting Rules. He only used three cans of paint on my mom’s chairs plus a little side table. Even so, I still spent less on two lounge chairs AND cushions than I would have spent on just one chair alone purchased new. 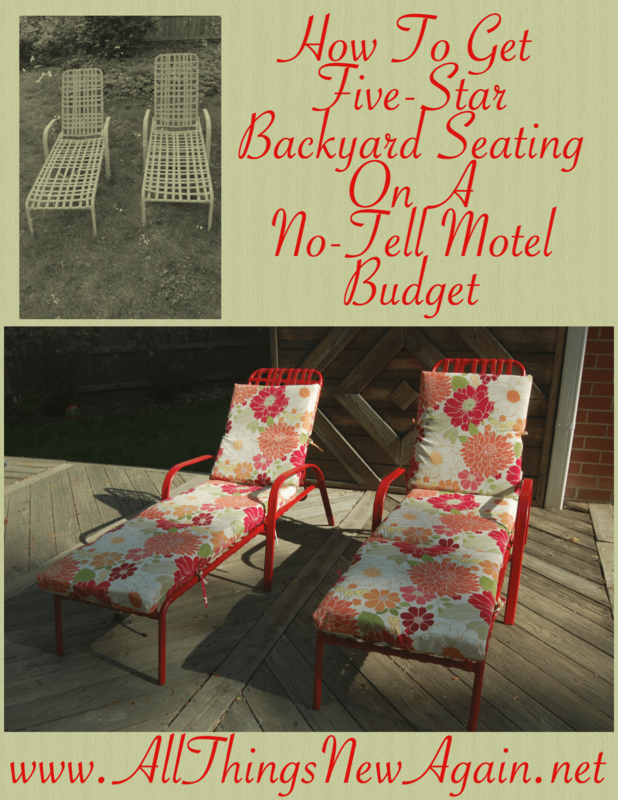 Five-star seating for my backyard on a no-tell motel budget! Lucketts Spring Market–Here We Come! The chairs look great! I’m inspired 🙂 Your newsletter is always so much fun to read and the descriptions are spot on! He may not but he has his nose in every nook and cranny. Got to love him though. what a fun pop of color. love that you chose red. So darn cute now! Love what you did and the colors you chose. Oh wow those look Great! 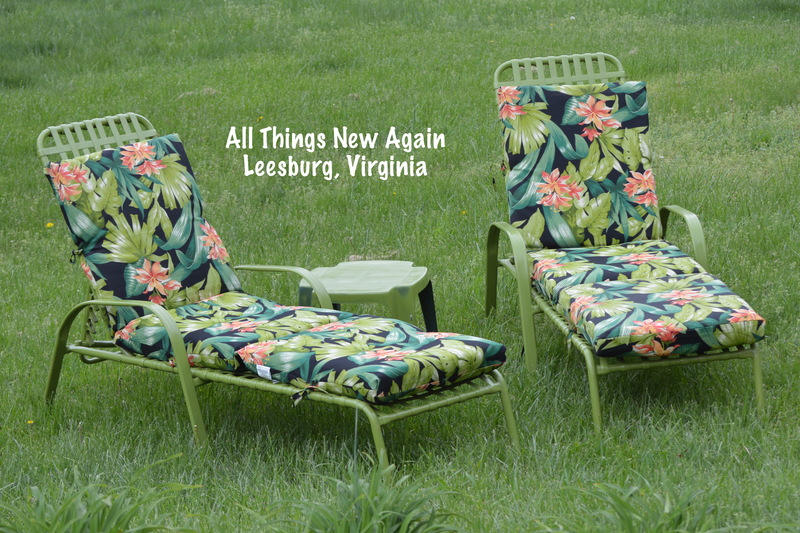 Weve been wanting some new patio furniture, but we wont pay the price either. Yall got a good buy, and did a great job on them. It is amazing what a fresh coat of paint can do. I’m impressed…they really look good, and so do your mama’s. Wow they look so good! Great job!